In a critical late-season New Jersey Athletic Conference match up on Wednesday night, the Rowan women’s basketball team dropped a nail-biter to rival Montclair State University, 71-70. 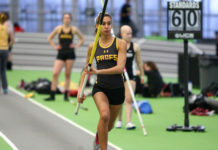 Rowan led the conference by one game over Montclair State and Stockton University entering the contest; the three teams now all occupy first place. With under a minute left to play, the game was tied at 67. Junior guard Anyssa Sanchez converted one of her two free throws and Rowan forced a turnover on Montclair’s next possession, which fellow guard Valerie Garofalo converted it into points with a floater in the paint. After a pair of Montclair free throws, it was the Profs that turned the ball over this time. The Red Hawks then took a one-point lead with only 5.3 seconds left to play. After a Rowan timeout, Graduate student guard Kaitlin Schullstrom inbounded the ball to Sanchez, who was met by three Montclair defenders and had to force up a shot. Rowan had another opportunity with one second left, but a travel was called as the buzzer sounded. 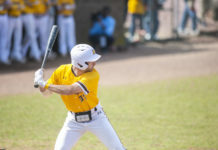 It was the Profs’ fourth loss of the season and just their first time losing consecutive games. The brown and gold shot a frigid 2-of-20 in the first quarter and found themselves down 15-4. However, a 25-point second quarter, including a combined 11 points from Schullstrom and graduate student forward Kate Matthews, led the team to pull within two at halftime. Rowan did not grab the lead for the first time until 7:08 left in the third quarter.